The UHC is the only non-Orthodox community in Asia with a weekly Thursday minyan. Come join our early-morning regulars in the UHC Office for a swift Shacharit and Torah reading. A professional tour guide will take the group around the former Singapore “mellah”. The visit will include trips to the two Baghdadi-style Synagogues and historic Jewish locations. The Asian Beit Din meets once or twice a year to examine conversion candidates and discuss religious matters in our region. The official opening of the APJ Summit, at a historic location, will include speeches by Frank Lavin (former US Ambassador to Singapore), Simona Halperin (Israeli Ambassador to Singapore) and Carole Sterling (Chair of the World Union for Progressive Judaism), as well as music and light refreshments. A welcome and brief introduction to the day’s proceedings will be given by Stefanie Green, APJ Summit 2019 Organizing Committee Chair. The first Progressive Community in Asia was the Jewish Religious Union in Mumbai, India, established in 1925. Since then several others have followed, including in Tokyo (1953), Beijing (1979), Hong Kong (1988) and Singapore (1993). This session will look at some of the stories and personalities involved in the history of these communities, and the challenges involved in their establishment. Jewish life in Asia is not only about ex-pat communities! In both China and Indonesia we are witnessing the revival of Jewish life in our times as families and individuals with Jewish roots are making their way back to our faith. This session will hear from some of the leaders of these communities and those who are involved with guiding them and studying this global – and regional - phenomenon. Many of our communities in Asia have demographics that are unique to our region, and as our movement grows in strength there will be more and more people with both Jewish and Asian identity of various kinds. This panel will hear some of these stories and address the joys and challenges that come from this dual identity. The last decade has seen the founding of new progressive communities and groups across Asia, each with their own circumstances. This panel will share some of the stories from their communities, and consider what needs to be done in order to transform these nascent and pioneering groups into budding and fully-fledged communities. We will consider whether to consolidate the APJ as a formal body and what our next steps will be, including dates and a venue for the next APJ Summit in 2020. A musical Tots Shabbat will be led by Rabbi Jordan Helfman (Holy Blossom, Toronto). Perfect for kids under the age of ten. We will commence our Shabbat with the UHC Community with a joyous and musical service, accompanied by local and regional singers and musicians. Enjoy a post-prandial pot pourri of music and song led by Vered Harel (Etz Chayim, Melbourne), with contributions by Dan Kohane (Kehilat B’nei Hof, Bali, Indonesia), Richard Kazn Young (Mumbai, India) and others. Our Shabbat Morning Service will be held in traditional UHC style in the home of Harvey and Rosita Goldstein. A sumptuous kiddish, lovingly prepared by Rosita, will follow the service. Throughout the APJ Summit you will have the opportunity to purchase a signed copy of Rosita’s 2018 publication, My Secret Recipes, as featured locally and on myjewishlearning.com. The Torah is said to have seventy faces and our job is to uncover as many of them as possible. Amid the beautiful ambience of the Singapore Botanic Gardens, take the opportunity to enjoy different interpretations provided by some of the remarkable crew of global rabbis visiting Asia for the APJ Summit. The participants will be divided into small groups for an optimal study experience. 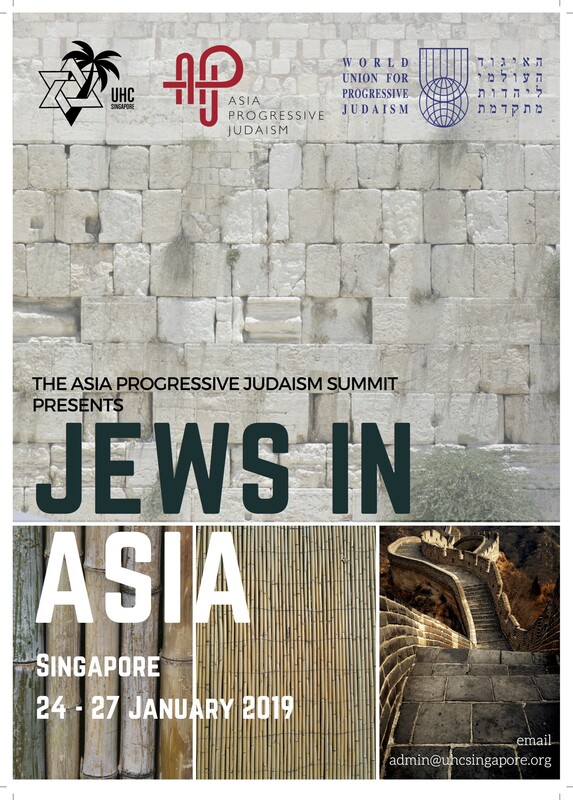 The APJ Summit will join UHC members and alumni to celebrate twenty-five years of Progressive Judaism in Singapore! Our Guest of Honour is UHC Rabbi Emeritus Lenny Thal, who will give the after-dinner speech. Proceedings will begin with a musical Havdalah, and the (adults only) night will include an auction and a late-night dancefloor. This program is for lay and professional leaders of Jewish communities and institutions from across the region. This seminar focuses primarily on strategic conversations about Jewish communities and the challenges for the future, while providing an opportunity for a mutual exchange of ideas between leaders. Jonathan Gerstl will be delighted to speak to you about the opportunities for Asian kids from our communities to join Camps Airy and Louise, that are run under his direction. This session will be open to UHC parents and take place alongside the UHC’s Religious School. The Summit concludes with a brunch featuring Singapore’s finest bagels and lox, sponsored byt Camps Airy and Louise. A chance to say your goodbyes whilst meeting parents and children from the UHC’s Religious School. Presenters: The list of confirmed presenters will be updated periodically. Home hospitality - Sorry but registration has closed for home hospitality.